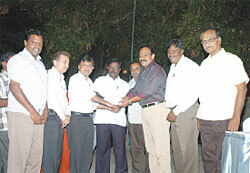 During a special function held on the lawns of Hotel Velan, Tirupur, on the evening of April 11, 2009, Anil Brahmbhatt, President & Dhiren Shah, SGAI founding member handed over a montary token amount to T. R. Shrikanth, President, Tirupur Export Knit Printers Association (TEKPA). Terming this as a small contribution for TEKPAs future growth, Anil Brahmbhatt said that this was SGAIs way of extending a supportive hand to TEKPA’s endeavours towards educating industry members and increasing awareness about screen printing developments in Tirupur. “As the apex national body of the screen printing industry in India, we have made it our mission to ensure that screen printers across the country are able to upgrade their quality and deliver quality output, which is on par with the best in the world. To facilitate this, we have been organising various informative seminars and interactions at a national level. We have seen that TEKPA is also planning a similar initiative at the regional level and has been making sustained efforts to improve the knowledge levelof printers in Tirupur. This monetary contribution is a show of solidiarity from the national association, SGAI to the regional association, TEKPA as a pat on the back to keep up the good work,” Anil Brahmbhatt declared. T. R. Srikanth voiced his appreciation of the gesture by SGAI and reiterated TEKPAs committment towards educating industry members and increasing awareness levels.